WHY : A time to share fellowship, and hear from various speakers. In Trinity, Boardmills a sizeable group of ladies of all ages meets under the auspices of the PW usually on the 3rd Thursday in the month from September to April at 8pm in the McKee Hall. 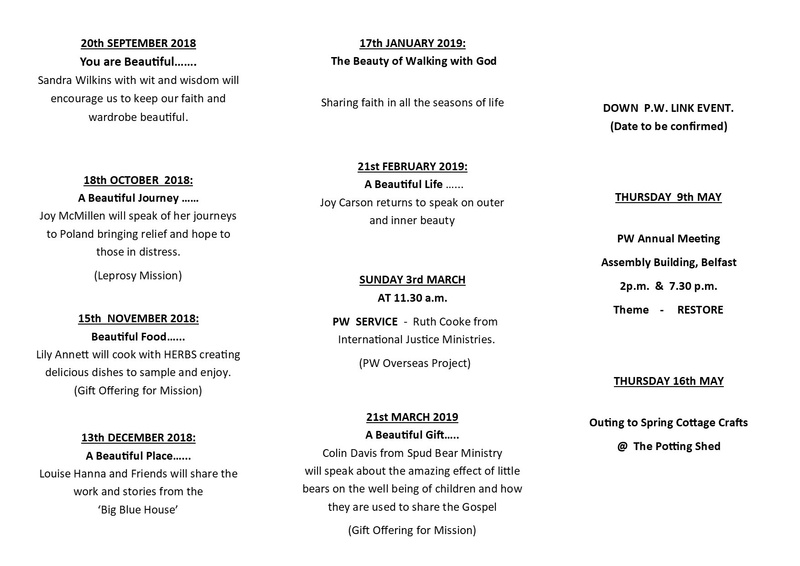 Each month we have a different speaker who will share a talent or skill, teach us a new skill, challenge our faith, share their testimony or inform us about new opportunities of serving God locally or globally. PW Groups are envisaged as women’s fellowships in which women are encouraged to become Christians and to become Christ-like. In addition to supporting mission at home and overseas, we seek to actively reach women in this area for Christ.